I was never a huge fan of the original High Roller, originally trying it in the old Maxxis 2.35in carcass (which was actually closer to 2.1in) and finding it difficult to trust. The 2.5in versions were a lot better, but still nowhere near as good as the 2.5in Minion DHF in my opinion. So the HR2 wasn’t at the top of my new tyres shopping list, despite Maxxis claiming they’d solved the old problem of the lack of grip between the centre and side knobs when leaning it over. 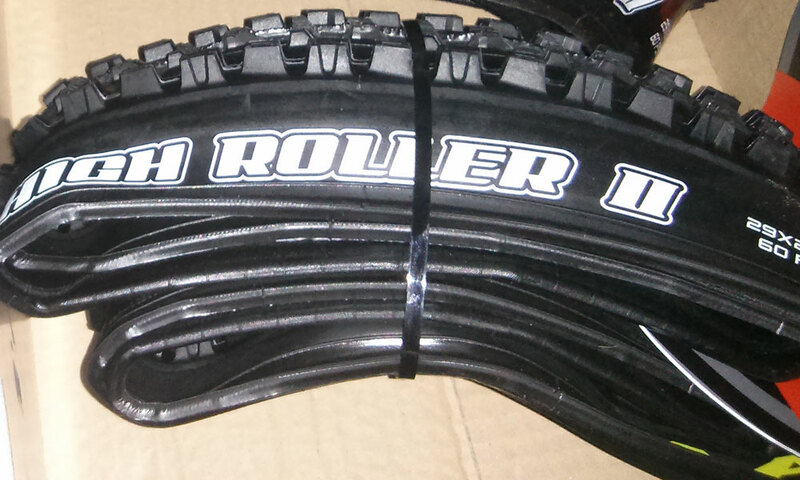 The Maxxis High Roller 2 fresh out of the box. However a bargain priced 29in 3C EXO model on a French website convinced me to give it a go – and I’ve been running it on the front of my full-sus 29er for the last nine months. Mounting it tubeless was simple with a compressor and the 2.3in carcass looked much more accurate in size than the old 2.35in. It’s not as chunky as some tyres, but I’ve settled on about 2.3in as the best size compromise for 29in tyres anyway. The obvious difference to the old HR is that the centre paddle treads extend further towards the edge, but there is still an obvious relationship to its predecessor. From the first ride I felt comfortable on the HR2. It just gives solid and predictable grip at any angle and in a good range of conditions from firm to dry and loose and slightly sloppy. Still providing good grip after nine months, but showing signs of wear. To be honest, it feels a lot like a Minion DHF in most conditions – which is high praise in my book – but the wider-spaced knobs seem to give it a bit more versatility for dealing with loose, loamy and mildly muddy conditions. Of course it doesn’t cope so well with proper gloop. It’s willing to give it a go and you might get away with it, but eventually you’ll find yourself skating across the mud rather than digging in. 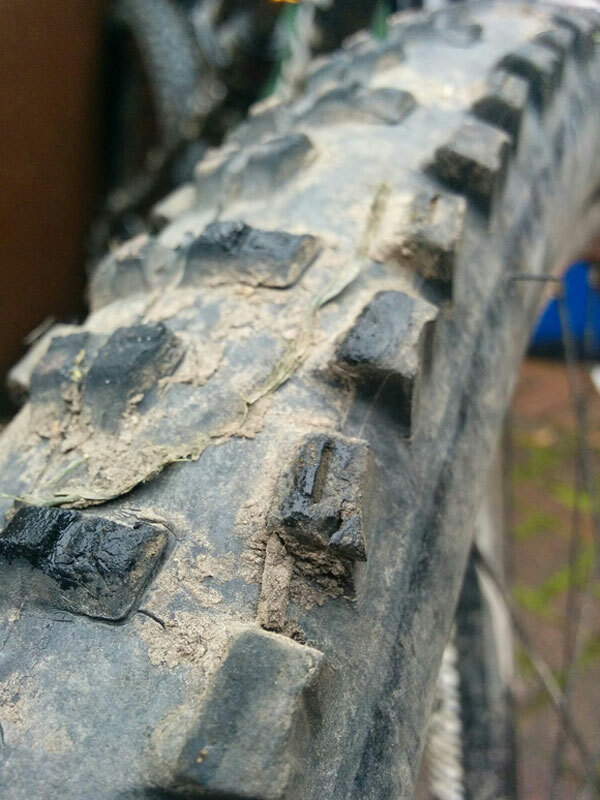 The EXO carcass has been its usual excellent self and I don’t think I’ve had a single puncture in the whole time I’ve been using it as a front tyre – which has included many fast and rocky descents across Northern England and Scotland. 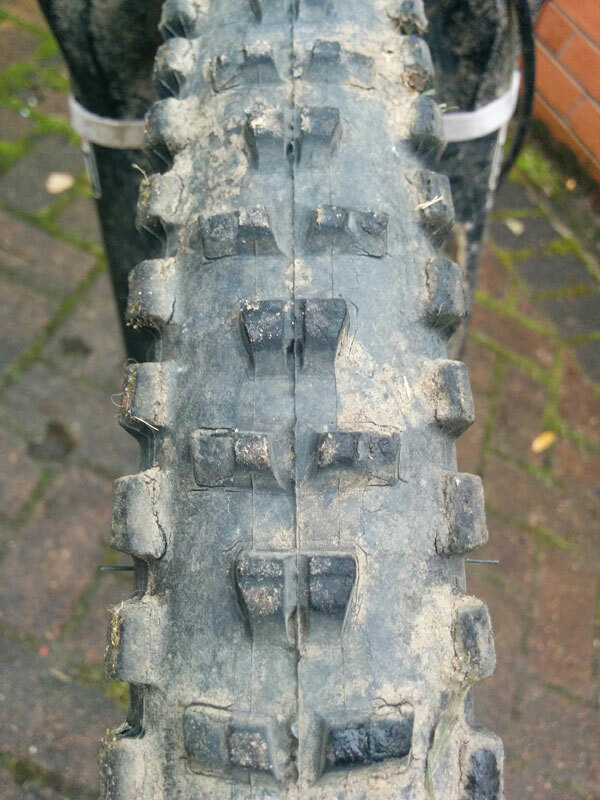 The only slight negative for me has been the wear rate – which has been a bit higher than I’ve come to expect from Maxxis 3C tyres. In fact it’s looking decidedly worse than the 60a DHR2 I put on the rear at the same time. I’ve still had good value out of it personally – but it’s now coming to the end of its life with lots of crumbling at the edges of the tread blocks. I must say at this point that I’ve seen other owners mentioning this on the web – leading me to wonder whether there could have been a production issue with some 3C HR2s. I saw some owners had returned theirs and been given replacements which had served them better – but I’d probably left it a bit late for that myself. This hasn’t soured me on the tyre at all though, and I think I’ll be looking for another one to replace it – rather than a Minion DHF.